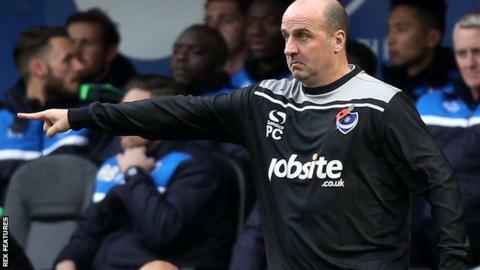 Portsmouth manager Paul Cook feels the lead up to the Christmas period will define League Two this season. Pompey have gone four league games without a win following Sunday's 0-0 draw at home against Wimbledon. Cook's fourth-placed side play Carlisle on Saturday, but are now nine points behind leaders Plymouth and two points outside the automatic promotion places. "We've got to make sure that if that's where we want to be, the results get us there," Cook told BBC Radio Solent. "I feel this period we're just entering that will take us up to Christmas, will probably define the league. "I think you will see teams like Plymouth start to show signs of maybe breaking clear. Oxford are certainly hanging on to their coat-tails." Cook confirmed striker Jayden Stockley has returned to Fratton Park following treatment for an ankle injury at parent club Bournemouth. But the 22-year-old is not expected to be in contention for a return to action until the end of the month.